I spoke several times with him. As far as I know he has no plants left. Some years ago he gave most of his plants away. I picked what seemed to be interesting but there were only 899 J and A among the plants. Meeder, Eugen Schleipfner and CitrusBali might have some other varieties. But it seems many have lost the letter so it is often only HRS 899. Yes I think the mature plants might have different leaves now. In his description only O and Q are fully trifoliate . Here you can find some results from the cold tests. How many HRS 899 do you have? Could you check your plant again I am very interested. Mikkel, thanks for the winter hardiness information. It's apparent there's a great deal of variation between individual cultivars. I wonder if you observed the seedlings with tendency of autumn leaf yellowing/falling ? Ilya11, There is considerable variation in leaf color, some are very dark green, some are showing a bronzing response to the cold. Others show a reddish tint where the leaflets join the petioles. The F1 seedlings are uniformly dark green and shriveling as they desiccate. There are a number that have a yellowish cast, but most leaves have not dropped at this point. One thing to keep in mind is that straight Poncirus often isn't reliably deciduous until the third year. I'm attaching a photo of self seeded 2-year old pure Poncirus that have changed color somewhat, but still haven't dropped their leaves. Thank you, I am quite convinced that for the robust hardiness beyond zone7, the citrus hybrid should drop its leaves in autumn. Among my F1xcitrus seedlings such plants are extremely rare. Ilya11, I agree with you. It's very likely that being evergreen puts too much stress and demands on the plants. There are a few plants that have dropped their leaves. I am not certain if this is from stress or preparation for winter. The trees I favor at present may not be the best in the next several months. The present low temperature event has struck the local area. Recent daytime highs are approximately +15 deg. F., today is expected to reach +20 F. Local lows have been +3 F, -11.8 F, +2 F and tonight + 10 F. The - 11.8 F reading was considerably lower than the forecast. These midwinter temperatures aren't a problem for Poncirus. Concerning the F2 citranges, however, this is a severe test. I will survey the plants again once we get a prolonged thaw . Survival is obviously not assured. A thaw is forecast to begin tomorrow. If any manage to survive they will be protected in subsequent winters. At least all your C35 nucellar seedlings will be dead, C35 is probably the least hardy of all citranges. However, I predict we'll see a lot more hardiness manifest in the F2 generation, at least in 25 percent of the seedlings. That's because another cross has the chance to eleminate dominant genes that may carry cold vulnerability, or manifest recessive genes that would carry cold hardiness. When you have an F1 cross, you're pretty much guranteed that 50 percent of the genes are going to come from poncirus and 50 percent from orange, but when you take that hybrid and cross it again, even if it's with itself, there are a lot more possibilities. You might (though exceedingly unlikely) even be able to manifest all the good genes from the edible orange parent with all the beneficial cold hardiness genes from the poncirus parent. Poncirus contains several gene regions responsible for its freeze resistance and its genome is highly heterozygous. That is why F1 hybrids with citrus are showing a large variation for winter hardiness. Three hundreds of its F1 hybrids with very frost sensitive pummelo show a wide distribution of freeze damage. Quite possible that C35 citrange inherited a rather unfavorable set of gene alleles from its poncirus parent explaining its poor winter performance. Newly bred variety, the tests haven’t been finalized yet. It is a cross of tangerine variety 'Changsha' and Poncirus. It grows well and fast, has only simple leaves and is significantly hardier than the citranges 'Rusk' and 'Morton'. Its flowers are small, comparable to those of tangerines. B. Voss says about 15 clones labeled HRS and a capital letter, of which the clone 'HRS-899 J' is supposedly hardy to -15°C and the clone 'US 899 F' has much more vigorous growth. Its leaves mono-, di- and trifoliate and it’s a little bit hardier. Today's high temperature is 45deg. F. I've taken a few photos to see how the best plants have fared. Most look similar, but a little worse for wear and tear. The best ones look to be in similar condition to my Poncirus of similar size. These may have a chance at survival. This is after almost a week of temperatures below freezing, the lows ranged from +3 deg. F. to -11.8 deg F., there were several days of high temperature +/- +15 deg F. I am pleased with the results thus far, but percentages of plants looking this good are low. Of special interest to me is plant # 3 having a mixture of unifoliate and trifoliate leaves. It's surprising that anything that's not pure poncirus could survive -10 F.
I'd view this as a success. At this point I'm debating protecting a few of the most promising specimens for the rest of the winter, in order to preserve their genetics. It would be a deviation from my original plan, but I already have $2,000.0 in this project and it might be prudent. Although I can be certain that the seed parent is F1 C-35 citrange, there is no definitive proof that the pollen parent is the same. Depending on blooming time and seed grove layout, the pollen parent could be potentially be a citrumelo, or different citrange. The damage won’t show right away. The leaves and green in the branches will slowly turn brown starting at tips and the dead brown tissue works its way down to the trunk and then to the ground. I’ve had trees stay green until spring and then die. Look for cracks in trunks near the ground. If cracks form in trunks, probably gonna die. -15 degrees F and below freezing for a week, unprotected seedling poncirus hybrids, no. Miracle if some make it, and I would love to buy a specimen from you. I wish you the best in your endeavors. At least some of them will sprout from the roots. For me, the most promising is the last plant, for the first three the stems are already damaged. # 1: F2 citrange seedlings and the variability in cold resistance after a cold week with a low of -11.8 F. at the lowest. # 2: Poncirus that hadn't dropped it's leaves. Observed on a plant not fully hardened off. wow, if it stays like that you found your hardy F2 hybrid. Thanks, I am hopeful. Both photos were taken today and both plants were exposed to the same temperatures. I realized that there are still many weeks until April 1. when I consider all danger to be past. I have noticed that the slight red color where the leaflets join is not an indication of cold adaptation, but rather an indication of tissue damage. Poncirus indication of cold damage closely parallels that of the citranges. A few of the citranges appear to have hardier leaves than the Poncirus progenitor, this may only be because Poncirus would have dropped it's leaves at that degree of maturity on that position of the stem. This continues to be an educational experience. The local cold weather has been followed up by warmer temperatures and rain. 1. Poncirus leaves and twigs that appeared to be wilted and dying have re-hydrated remarkably quickly. 2. The combination of direct sunlight and frozen soil is very dehydrating. 3. Subzero temperatures with no wind on a clear night allows a super-chilled layer of air to form directly on top of the snow, which is very harmful, this layer was about 6" deep. I don't have record of the actual temperature of this layer, as the reading of -11.8 F. was about 30" above the snow. 4. The section of the stems above the bottom 6 inches showed considerable less damage than the lower 6". 5. The rather quick warming trend allowed some damage to be visible within days. 6. Some bark splitting is becoming apparent. 7. There will likely be additional observations over the next 6-7 weeks, perhaps longer. 8. Photos of Poncirus before warm up and after warmup and rain. This should be the same twig. 9. This Poncirus tree was planted in the early 90's. Kumin, excellent post, very detailed. After a new survey of the F2 citranges, I remain cautiously optimistic. The best looking plants remain quite consistent, although a portion of previous candidates look less promising. The best contenders are likely well under 1 percent of total plants. One factor in their favor is the fact that our area has had record high moisture levels since July of 2018. The plants should have been well hydrated at any time the soil hasn't been frozen. An other unanticipated factor may be the black plastic film used for weed control. I suspect this will lessen the freeze/thaw effects to some degree. There's an attached photo of a Southern Magnolia cv. 24 Below. This is included to gauge the impact our cold event had on other plants with hardiness similar to Poncirus. All cold damaged leaves will be shed during the May flush of new growth. Updated status of best looking F2 citranges. Some are belatedly dropping their leaves rather than shriveling on the plant. I'm edging closer to believing there will be survivors, but very few, perhaps 10 - 20 or so. March will bring it's own challenges, but the chance of getting sub-zero temperatures is decreasing. An update as winter is just starting to ease up. All photos were taken today. All plants are in ground except the first, which I potted up to allow for better protection and mobility. This plant went through all the cold -11.8 F, etc. 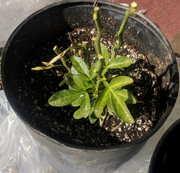 the rest did except for the last several nights when it had been potted.